There is an old project Intouch 8.0, everything works fine, but the trend display is not convenient (old system). On another project uses Wonderware Development Studio with comfortable trends (probably the components ActiveFactory). 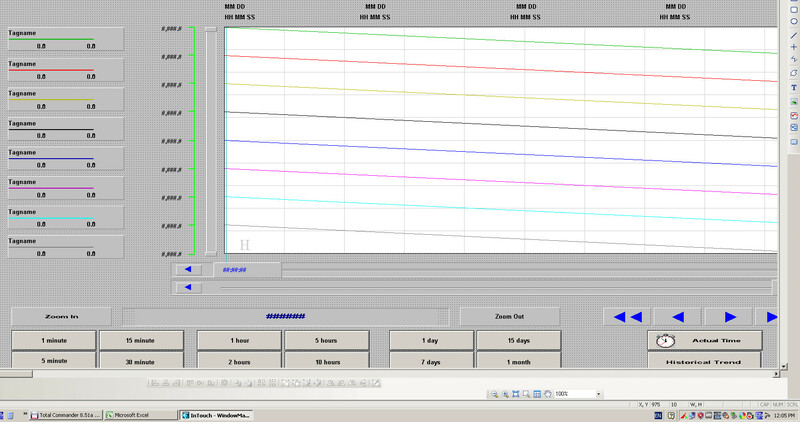 I want to use component for displaying trends of Wonderware Development Studio in the old project HMI. Installed on your computer Wonderware Development Studio 10.0, migrated old project Intouch 8.0 -> 10.0. Integrate it into arhestru probably do not need it? Add Component ActiveX (aaHistClientTrend Control) in the project. As it is now configured to display tags, how to bind to a database ??? Now the data is written to the disk D, archives files * .lgh and * .idx. Есть старый проект Intouch 8.0, все работает нормально, но отображение трендов не удобное (старая система). На другом проекте используется Wonderware Development Studio с удобной системой трендов (наверное, это компоненты ActiveFactory). Я хочу использовать компонент отображения трендов из Wonderware Development Studio в старом проекте HMI. Установил на компьютер Wonderware Development Studio 10.0, мигрировал старый проект Intouch 8.0 ->10.0. Интегрировать его в архестру,наверное, не нужно? Добавил компонент ActiveX (aaHistClientTrend Control) в проект. Как теперь его настроить на отображение тегов, как привязать к базе данных??? Сейчас данные пишутся на диск D, архивы в файлах *.lgh и *.idx. Can anyone explain is possible to create Trend that can show negative values using Archestra Toolbox? I am trying to make some faceplate for controller which contains trend created using Trend Client. Has anyone any idea how to make it? I don't want to make this trend in using popup window in InTouch since in that case, I need to make new window for each controller.